Office ruling that only the top 5% of skilled chefs can migrate to the UK. we were greeted by tour guide and Public Relations man, Dickson Mumpsimus (left). 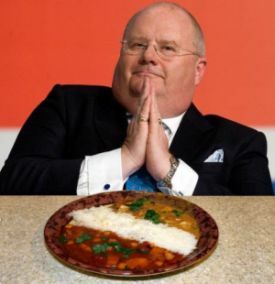 oppress our much-victimized Caucasian majority, Pickles is seen as the man to take action and restore Britain’s balance. a number of dissenting voices across the country, with Wirral-based curry blogger Pharoah Weiner particularly vociferous. College of Fine Indian Cuisine, Pickles confirms no expense will be spared. after Pickles got hold of the food, all he left behind was dirty plates, soiled towels, and a pile of empty chocolate wrappers. An old-school curry chef prepares 'the usual' for Mr. Pickles.